Angels, thousands of you sang out to the tune of a huge over 90% buy-again rating the last four vintages, so one of your faves is back! Luke has upheld his long term goal, only releasing this Top Shelf Cab once aged to perfection in French oak. The palate shows off layers of blackberry and liquorice spice with refined and smooth tannins. A guaranteed scrumptious winter warmer! The wine was hand crafted using pristine single vineyard grapes from 40 year-old Coonawarra vines. The region is hands down the number one region for Cabernet in the Southern Hemisphere. Take one sip of this liquid gold and you'll taste the dividends of Luke's extra years of investment in ageing. 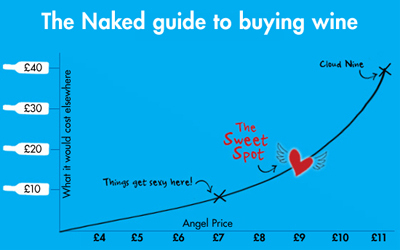 At under $20 for Angels, the value simply can't be matched elsewhere and stocks will fly once again. Make no mistake, this is one delicious gem you'll be wanting to stock up on! Simon ‘Sorby’ Adams' first-up, single vineyard Pinot Gris from the high Eden Valley in the Barossa ranges offers pristine fruit flavours, a whisper of spicy complexity and yummy elegant crispness. It is a beautifully styled Pinot Gris, with fragrant aromas of jasmine, poached pear and green rockmelon, leading to a succulent palate that is deliciously rounded and silky. Get ready for a succulent Pinot Gris that is sooo drinkable you’ll be rushing back for more! Cheers to a new era for Naked SA Shiraz! This juicy, brooding number has been tried and tested by thousands of Angels over the years, each vintage delivering its own personality. The 2017 vintage delivered powerful berry layers and a persistent finish. Delivering quality from vineyard to your table is the driving passion for Geoff and his team. Transforming their Lodestar label into their re-energised Grounded Cru project has been spurred on by unprecedented opportunities and amazing Angel feedback since starting their Naked journey in 2013. If the history, flavour and moreish nature of this wine isn't enough to have you head over heels, the tiny Angel exclusive price will have you looking twice and stocking up. Enjoy every sip of this trusty little red, you've earned it! Adam's outrageously popular Riesling is back, and we are buzzing! Its refreshing, zippy character thrives in the eyes (and glasses) of Angels all around the country, racing off shelves every year. With a new label design, and still under $12 for Angels, the 2018 vintage will no doubt put on a repeat perfomace. Crafted with care and based on a solid collaboration of winemaker and grower, the Cellar Works range delivers a dynamic duo of fragrance and flavour. Think lime and grapefruit, with delicious drops of apple and pear to tickle your tastebuds. The finish is crisp and will leave you wanting more. Any white lover would be mad to miss this lovingly crafted, modern style Riesling from a premier Australian winemaking region. The grapes were harvested a mere 5 months before the finished product hit the Naked website; an incredible achievement made possible by Angels! Dive on in to a world where fresh, easy drinking white wine reigns supreme! Honeysuckle and exotic spice aromas will draw you in, leading to a flavour packed palate of pear, grapefruit and a hint of wild honey. Grounded Cru is Geoff Thompson's new era project following on from Lodestar Wines, opening up more possibilities to create unique and exclusive wines for Angels. This Pinot Gris has a juicy palate, elegantly balanced with a delightfully fresh and long lasting finish. A truly versatile food wine, Geoff's Pinot Gris will be a great match to many family favourite Spring and Summer dishes. His masterful blending of top quality SA grape parcels has resulted in yet another scrumptious treat to fill your glass with. Both your taste buds and your wallet will be in heaven with this white gem. 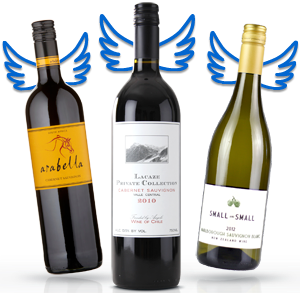 At under $11 for Angels and scoring a massive 91% buy-again rating from thousands of other drinkers like yourself last vintage, it's an undeniable case-filling winner! Luke has done it again. Crafting the perfect sparkling for any occasion, he has created a traditional Prosecco style: bright, balanced and refreshing. Aromas of floral tropical fruit flow through to a thirst quenching lemony limey acidity, with just a hint of residual sugar to soften the mouthfeel. It leaves you wanting more! The perfect blending of three varieties that work so well together. Chardonnay giving body and complexity, Riesling giving floral hints and acidity, and Sauvignon Blanc giving some tropical aromatics. At under $17 a bottle this is the guaranteed party-starter!